Sorry for the delayed posting. Been a hectic few weeks due to a new shift change at work (now working 11:30 to 8, as working into the evening gives me an extra dollar an hour). But I did want to write quickly and let everyone know that after visiting the doctor, we are having a girl (Lucy Hartley Faber)! Yes, I was hoping for a boy. Since my sister has two boys, we would have gotten more hand-me-down items, and when our kids get to high school, an older brother would be added security when it comes to my daughter bringing home some boy who just wanted to get into her pants. I'm not going to go King Henry VIII on my wife for not giving me a male heir, but part of me was a little disappointed. For about 45 seconds. Then I started thinking about how amazing it would be to have a daughter, and since that Ultrasound, I'm counting down days in my head until our daughter is born. Ironically, the ultrasound showed something I'll appreciate later on in life. The nurse was unable to actually see the baby's reproductive organs on the screen, instead pointing out three little white lines. These lines are apparently what is used to determine gender. And it was then that my wife made an outstanding observation. "The one time you want your daughter to spread her legs, she doesn't do it!" Yes, our daughter being uncooperative during the ultrasound (delaying the gender reveal by 30 min or so), was frustrating, but I'm sure when she hits high school, I'll be thankful that she's already made the right decision to keep those private parts hidden from the world. Before the gender was revealed, we knew we were having a baby. But finding out if the baby would be a boy or girl just seemed to make it more real. Instead of us having a baby being some abstract idea that would get here on Feb. 29, 2012, it got real. 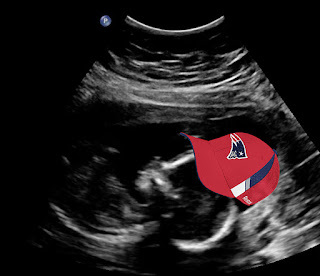 As if a candle was lit inside my brain, it dawned on me that I'm going to become a father. I'm going to have a daughter.